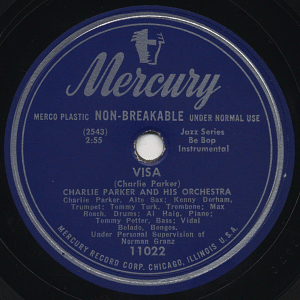 Among all 78rpm/45rpm single release on the Mercury label, 8900 / 11000 / 89000 series were entitled “Mercury Jazz Series” (or “Be Bop Series”). The main contents are from the materials produced by Norman Granz. Most materials listed here later reissued on Mercury LP (MGC Series) or Clef / Verve LPs, but there are a few materials which can be heard only on this 8900 series (recent CD reissues may contain them as bonus tracks). It is remarkable that released order seems to be so complicated - most titles were issued firstly on 78rpm, then 45rpm edition followed. Some titles might be made available both on 78rpm and 45rpm at the same time. The most complicated matter is, since these 7800 series were released just around Norman Granz left Mercury and started his own Clef label, identifying which titles were released on Mercury (and which titles were relased only on Clef) will be one of our future questions. Titles with bold numbers (NON-grayed lines) indicates that I own the copy. If you happen to know the titles/artists of the albums unlisted here, or if you found any incorrect information, please let me know. Thank you. visitors to this page since June 3, 2005.